“I swear, I’m not crazy,” said every crazy person, ever. Sawyer Valentini (Claire Foy) is a young professional living in Boston, where she does what she can to get by and deal with all sorts of trials and tribulations that young people like her meet on a daily-basis. But then, it all changes when she has a nervous-breakdown, makes some sort of a wisecrack that she may kill herself, and is sent to a 24-hour voluntary-stay at the Highland Creek Behavioral Center. Sawyer doesn’t believe she deserve to be there and her mother on the outside (Amy Irving), does whatever she can to get her out, but because of some fraudulent agreement between the clinics and the insurance companies, Sawyer’s going to have to stick around much longer until, well, the money runs out. Until then, Sawyer is stuck in this clinic where she’s forced to deal with fellow patients who don’t like her, nurses who don’t like her, and suddenly, a mysterious man from her past (Joshua Leonard), who may or may not have sinister intentions. 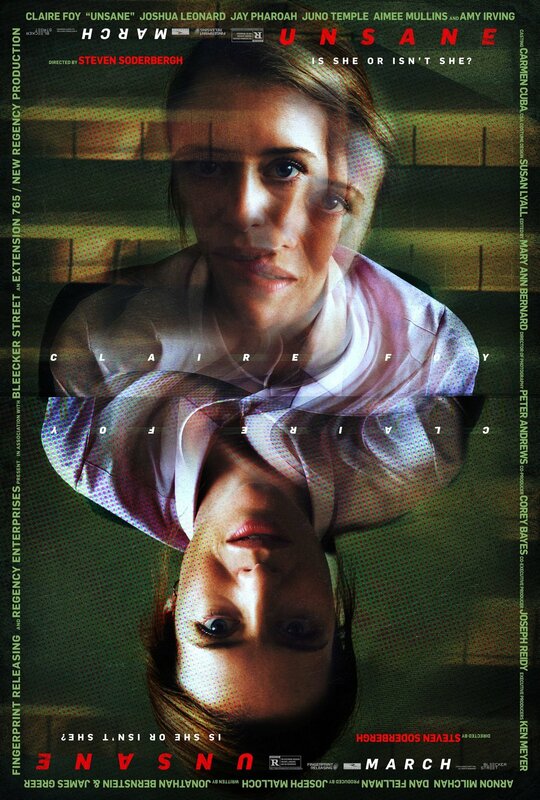 The whole gimmick surrounding Unsane is that it was shot entirely on an iPhone, which should come as no surprise to anyone who has followed the career of Steven Soderbergh. He’s always one to play around with new technology, experiment a bit, and in some ways, alienate his audiences from what they can expect from him. He’s the rare aging director in Hollywood who still has a clout to his name, has got all of the connects, and oh yeah, can shoot a rather mainstream movie on an iPhone, keep the budget as low as $1 million, and still find a way to get his movie a wide-release. And well, the gimmick actually plays off, where it becomes less about the gimmick taking over the movie, and actually working for the story itself. While some may definitely be thrown off initially by the digital and over-realistic look, to me, I got over it right away; it reminded me most of a Dogme 95 film that was meant to be super-gritty and hyper-realistic, almost to the point of where it looked like it’s a fly-on-the-wall documentary. But what works about Soderbergh shooting Unsane the way he did is that it puts us in the mind-set of Sawyer, our protagonist, and has us not really know what to expect next, especially when the movie begins to get very creepy and disturbing. Which I guess is a spoiler? I’m not really sure. Wait. Didn’t this guy for real die in the Blair Witch? See, Unsane constantly becomes a few different movies in the span of its 100-minutes. At first, it’s a character-study of a young, single woman who suffers from nervous-breakdowns; then, it becomes an expose of sorts about the current hospital and insurance-systems that are tied at the neck; then, it becomes a psychological thriller where we’re stuck in the mind of Sawyer, not really knowing what she sees is real, or isn’t; and lastly, as it was advertised originally as being, Unsane becomes a horror movie, where we deal with some scary, rather dark stuff happening. Sounds like a mess and a total jumble, but it somehow totally works and makes you not really know what to expect from the plot, the tone, the characters, and especially, the director himself. It also helps that Claire Foy is pretty great in a role that shows her range and is totally against-type of everything that she does/did on the Crown. While Sawyer Valentini is the kind of hammy, over-the-top role that most actors like to play, just to show how wild and crazy they can get when they aren’t tied-down, Foy always remains understated and humane, even when her character is going completely off-the-rails. We always see her as a human being and never for once see Foy as just an actress, screaming and running her way out of being pigeon-holed. Even her smaller, more subtle scenes with Jay Pharoah’s character, a fellow, much more sane inmate, shows that deep inside all of the wacky-tendencies, lies a deeply troubled, sad, and misunderstood human being who needs a little love and attention, but seems to be getting from and/or for all of the wrong reasons. Wait a minute, wasn’t this a horror movie? Consensus: iPhone-gimmick aside, Unsane is an exciting, tense, and rather smart thriller that goes to many places, yet, is always held down in the middle by Foy’s accomplished-performance. Great review Dan! I’ve been looking forward to seeing this for quite a while so I’m glad it’s getting positive reviews!